See what’s in the April 2019 issue of Kayak: Canada’s History Magazine for Kids. 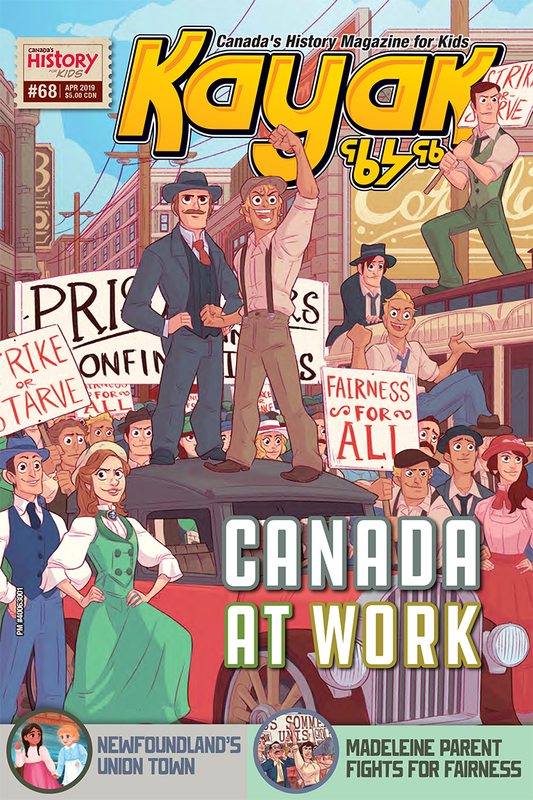 We’re looking at their stories in the April issue of Kayak to mark the biggest protest ever against unfair work in Canada, which took place 100 years ago this spring: the Winnipeg General Strike. Of course, the way we work and the kinds of jobs we do have changed a lot over time. And we sometimes forget that unpaid work takes a lot of time and energy, too. But even if you have your own part-time job or do a lot of work around the house, you can be glad that you’re not like other kids in our history who had to start earning money when they were your age or even younger. Fortunately there have always been people trying to help — to ensure better pay and better conditions for workers. There’s the tireless Quebec union organizer Madeleine Parent and Sir William Coaker who helped create North America’s only union-built town, Port Union in Newfoundland. But we promise: Reading this issue of Kayak won’t be hard work!